As French Connection considers a sale, where has the brand fallen behind its rivals? October 10, 2018, 12:53 p.m.
On Monday, news emerged regarding high-street retailer French Connection. The brand announced that it may be up for sale, prompting shares in the fashion chain to rise 25% to 55p. Following on from speculation last weekend, the firm said it was ‘reviewing all strategic options’ – one of which is a potential sale. French Connection has made a loss for each of the last five years. Certainly the brand is not performing in the same way it did during late 1990s, in which t-shirts emblazoned with the ‘FCUK’ slogan were ubiquitous around the country. 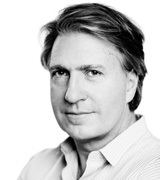 There is speculation that founder Stephen Marks could sell his share of the company. Sport’s Direct founder Mike Ashley currently holds a 27% stake. 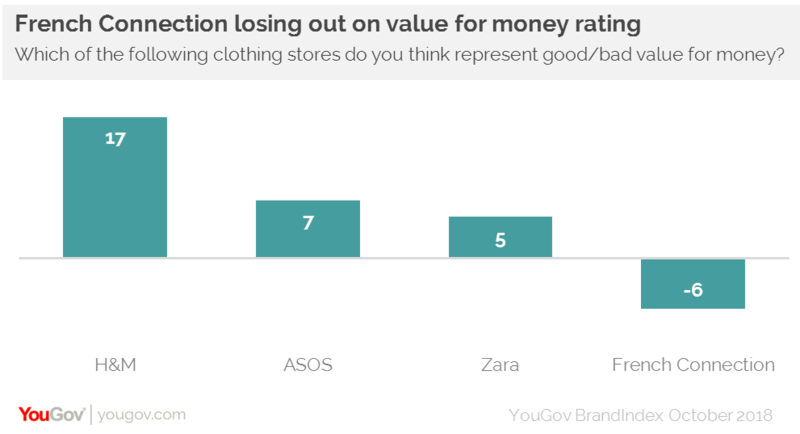 YouGov BrandIndex data shows where the brand has struggled in recent years, especially against ‘fast-fashion’ rivals, and those that trade exclusively online. Of the 56 brands that YouGov tracks in the high-street fashion sector, French Connection finds itself in 47h place in terms of value for money score (-6) among the general public. Brands such as Zara (+5), H&M (+17) have healthier scores on this metric. However, when we consider French Connection’s Impression score (whether someone has a positive or negative impression of a brand), we see it is actually quite healthy (+9). It does however lag behind Zara (+16) and H&M (+21) on this metric. Another positive is that consumers tend to view French Connection as producing good quality products. Its Quality score currently stands at +16, which does compare well to its high-street rivals. Indeed it is 14th in our list of fashion brands on this rating. This may indicate that while French Connection is generally well-liked – possibly due to the strong brand awareness and connection with customers it achieved in its heyday, potential shoppers are being attracted by cheaper prices offered by other mid-market companies. Whether a new buyer emerges remains to be seen, but naturally it will face a steep challenge in returning the brand to its former glories, especially in the face of well-documented challenges that are facing the high-street retail industry at the moment.